Jevanicia was a small mining town of around 3,000 inhabitants established by Queen Anajakaze after the destruction of Tectoctar. The town was named in honor of her son, Jevaninada the Second. Jevanicia was built with military precision after scouting out a good location, both in terms of access to resources, such as the nearby mines and farm fields, and firm ground for construction of permanent buildings. In almost every way that Tectoctar was bad, Jevanicia was good. 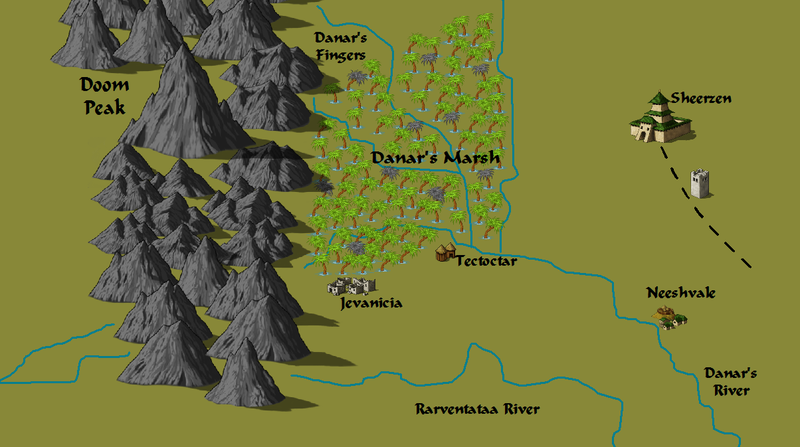 Jevanicia was expanded from the basic plan of a military encampment. A stockade surrounded the town proper with areas marked off outside the walls for planned expansions. This blueprint gives the town decent defense capability and provides a clear layout for foreigners. Most buildings were made out of wood while permanent structures were built out of stone. The intent was to move the “temporary” structures such as the smithy and stable, to alternate locations if the town expanded in the future. A fair amount of rice was grown in Jevanicia just as it was in Tectoctar before. Shorehorn flowers were also often used in dishes. Jevanician citizens used similar protein sources, lizards, fish, and snails, as the people of Tectoctar but with one important difference. Jevanicia was not cut off from the Xoria Empire and thus the new city had ample access to spices to make their vile food much more palatable. Peppered snail and curried leeches are only a few of the delicacies one could’ve eaten in Jevanicia. The new city did not serve as a refuge for exiles as Tectoctar did. Jevanicia’s primary draw was working in the mines. The city had an iron mine, a silver mine, and a stone quarry. Hundreds of tons of metal and stone were taken from the earth and sent downriver to the rest of Xoria. These raw materials were made into coins to fund the war, weapons and armor for soldiers, and keeps that protect the roads of Xoria. Unfortunately, the flow stopped recently due to an attack on the town by the Geriviar giant, Bill. Bill believed the town was responsible for the death of his pet dog, Scruffy. He beat the buildings of the town into dust and splinters. Hundreds died in the attack in a vain effort to save their town. After Bill left Jevanicia in ruins, slavers descended on the area, capturing those who attempted to rebuild their homes. Many miners were taken captive and sold downriver. By the time the Xorian government learned of the destruction of Jevanicia it was too late to reverse the decline. No manpower could be spared to rebuild the town, so it was left abandoned.